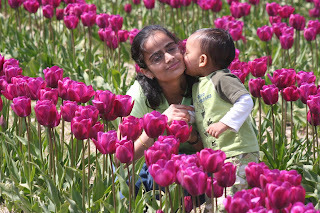 We went to see Tulips yesterday. 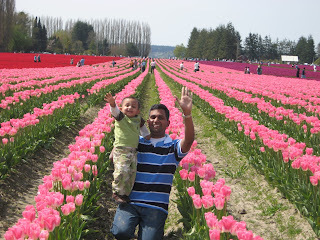 The place Skagit Valley is about 1 hr from our house. We went there last week as well, however it was snowing there by the time we reached, so we just came back. Yesterday weather was awesome. 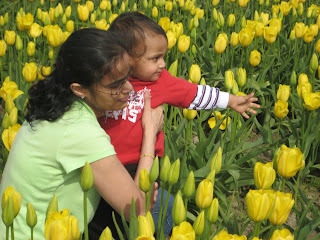 Kedaar was very excited to see all the flowers.This is his 2nd Tulip festival. 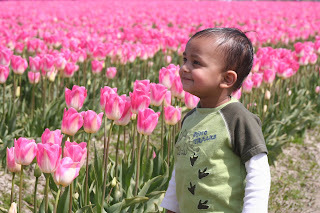 He really liked the colors, tried to touch the flowers saying 'touch' 'touch', he tried to smell them, he walked in the fields looking athe flowers. We have put some of the his in the albumn below. Kedaar completed 17 months on April 8th. 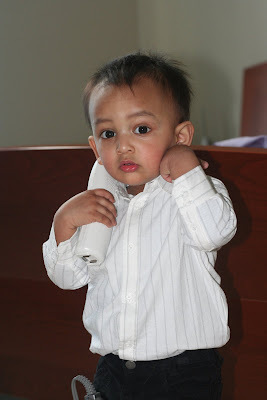 I was thinking to note that in his blog from few days and somehow the day today routine just keeps us busy without giving me time to do that.Kedaar started and tries repeats every word we tell him within no time. We have put few videos in the previous posts.Have fun. We went to a near by temple and had ugadi pachadi today. 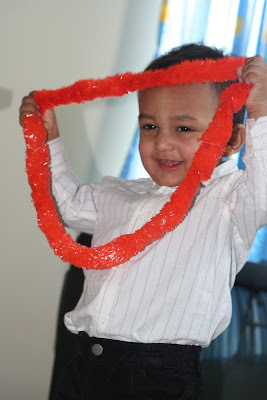 Its been 1 year since he started going to day care. 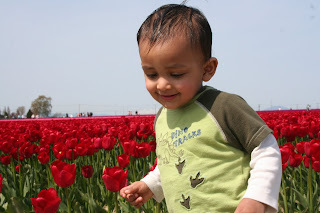 Now a days he is keeping little silent for a while when he meets strangers. Again becomes normal and plays with them after few minutes. Kedaar is picking up words very fast. Few days back he said new words Avuna (is it so), kaaki (crow), fish, duck, noone (oil), pasta (pasa), paripoyindi (ran away), ammamma, aamma, siz, seven, eight, two etc. He is just trying to repeat every word we say. He also dances little bit for rhythmic tunes. He also seemed to like music since he has been a kid, now he learned more like dancing, jumping etc when a rhythmic tunes comes. 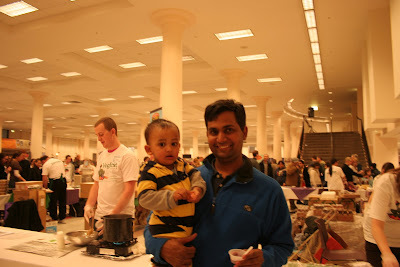 Last week we went to veggie fest that happened in seattle. Its basically tasting samples diferent vegetarian items. Kedaar tasted few items.